The mysterious Phil Musra blows "Egypt" on a 2009 Tube of You video. 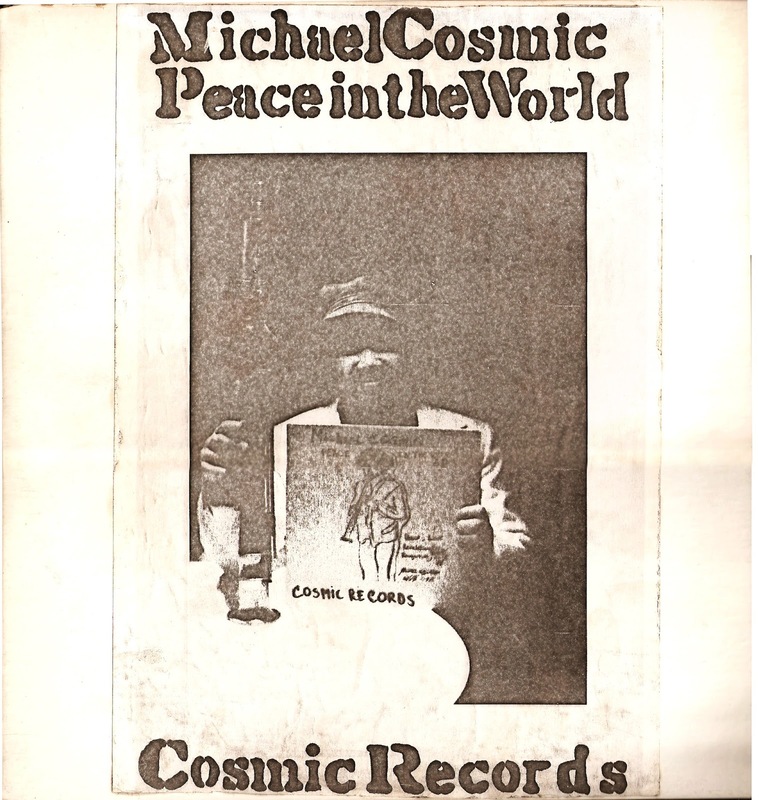 His twin brother, Michael Cosmic, is even more obscure, even though Cosmic's 1974 free jazz LP "Peace in the World" is one of jazz's most sought after albums. I was in graduate school way back in 1976, working toward a Masters in fine art at the University of Chicago in Hyde Park (admittedly, I was never shrewd about career choices). One afternoon I was walking to the studio, and I cut through a small park a few blocks from my apartment. Because it was a hot summer day and early in the morning, there weren't many people around. But right away I noticed two guys standing under a shade tree next to a park bench. They were both blowing saxophones, doing a bit of free improvising, and raising quite a din. 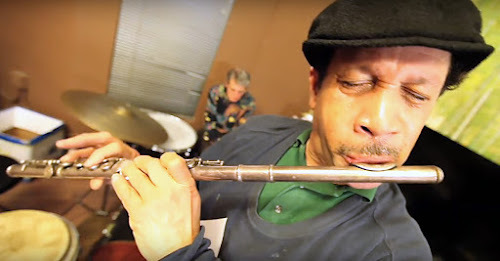 It wasn't unusual to see musicians performing on the street in Hyde Park and the neighboring community of Woodlawn, since many AACM members lived there. But these two guys I had never seen before, and I knew most of the AACM players by sight. It turns out the saxophone duo was the Cooper brothers, better known to the world as Michael Cosmic and Phil Musra. They were in Chicago, having left Boston earlier in the year, to study improvisation at the AACM's school of music. They were getting in a little alfresco practice time so as not to disturb the neighbors – and they were also hawking product. On the bench was a box of LPs that were for sale. 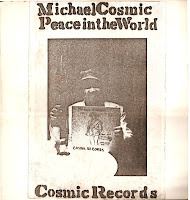 Being a supporter of creative music, I naturally had to buy one – an album titled "Peace in the World" by Michael Cosmic. The record was clearly a self-produced effort, and I didn't expect much. But it was music of the sort I was a big fan of, so I was glad to spend a few bucks. And it was nice to meet the guys who had recorded it, if only just for a few minutes. I took the LP home and stuck it on the shelf, and it's been there ever since. Fast forward 40 years, and in one of those inexplicable twists of cultural fate, Michael Cosmic's first opus has become the Holy Grail of record collecting. I've written about it before on Gems, expressing shock over the LP's $2K-plus price tag, but it wasn't until I received numerous requests that I considered offering it as a Gems download. 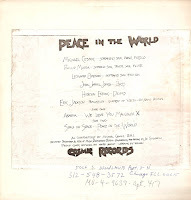 So here, by popular demand, is "Peace in the World." I believe that digitizing it for this posting was the first time I actually played the album all the way through. So how's the music? Ehh. Standard free jazz fare from the mid-1970s – not bad, but nothing extraordinary. "Spirit jazz" is how this sort of open-ended improvising is described today, especially when issued on self-produced discs. If the covers are hand-drawn, so much the better. Cosmic's record with its Xeroxes fits those categories, so that explains some of its appeal. But its valuation far exceeds any rational estimate of its worth, so I can only guess that the crazy price is just another example of the sort of mania that gripped collectors of Sun Ra platters a few years back. My advice to those of you who have a copy? Sell now before the market collapses! 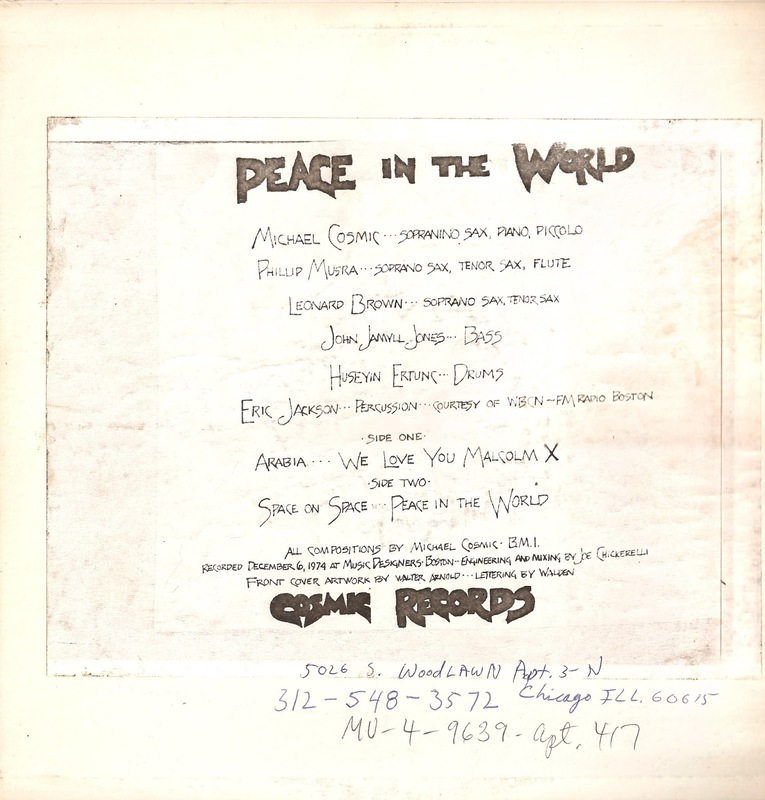 In an interesting note, either Phil or Michael – I didn't know who was who – wrote down their contact info on the back of the LP cover. They were apparently living on South Woodlawn Avenue near 50th St. at the time. I don't think they stayed in Chicago long, and I don't know if they performed anywhere but in the park. I'm pretty sure they never appeared as part of an AACM unit. So I was lucky to meet them, and luckier still to get a copy of "Peace in the World." These files are wavs, so expect a longer download time. They were created, of course, right from the self-produced vinyl, with no cleaning of the sound required. Now that's cosmic! Michael Cosmic, pic, ss, p; Phillip Musra, ss, ts, fl; Leonard Brown, ss, ts; John Jamyll Jones, b; Huseyin Ertunc, d; Eric Jackson, perc.